The remaining part of the Siedlung is composed of terraces of north/south-facing houses, serviced by lanes perpendicular to the street. Each house accommodates two families. On the side opposite to the service lanes there are two adjacent gardens. One is a direct extension of the ground-floor dwelling, and the other is assigned to the upper floor. The sequence of service lane/ house/ground-floor garden/garden of the upper-floor dwelling, which is repeated in each unit, reproduces the arrangement we have observed in the apartment buildings. Between two streets and perpendicular to the rows there are some wide gaps, planted with trees, which cross the Siedlung. These provide a network of pedestrian paths and children's play areas separated from vehicular traffic. Siedlung Westhausen: the lane servicing the dwellings. Twin entrances are here separated by a planted hedge looked after by the inhabitants. Cars circulate on a network of roads perpendicular to the rows of houses. Romerstadt no longer exists here and the organization of the rows has only a very abstract relationship with the traditional block. Nevertheless, the arrangement of public fronts and private backs is continued and allows the space around the buildings to be appropriated in the same way.77 Three problems became apparent with respect to the gardens of the high dwellings, the lanes and the corners in this layout. 76 Housing several families under the same roof is part of the German working-class tradition. The steps taken by May to solve the housing crisis included building a large number of small dwellings very quickly so that they could be later joined together to form larger ones. 77 The recent maintenance programme has progressively suppressed all extensions, verandas and pergolas, which had happened on the back façades and could still be seen in 1973.
tually constructed extensions, which were easy to build around the original steel-framed pergolas. Vegetable plots were located towards the ends of the gardens. The case of the gardens allocated to the upper-floor dwellings is different, because no direct extension of the living space is possible. In certain cases this space was neglected, abandoned or taken over by the ground-floor garden. Alternatively, it is used in a very utilitarian manner for growing vegetables and there is sometimes a tool shed. Where it is used as a garden with space for living, with benches, a pergola, a hammock etc., it is then oriented towards the service lane and offers a front on that side of the garden. 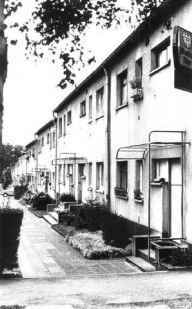 In the first row on the Zillerstrasse, the upper-floor gardens are placed in front of the houses, into which one can exceptionally enter through lanes on the axes ofdoors. Very much exposed to public view, these gardens are reduced to lawns, ornamented with some decorative plants, and they play an exclusively representational role. The status of the service lanes is ambiguous, because they run behind the gardens. The house entrances, grouped in twos and marked by small steps, define a front space, emphasized by a flower bed, which gives some privacy to the ground-floor windows. In front of each entrance, an enclosure in the gardens conceals the dustbins. This disposition is sometimes resented by the inhabitants, who like to hide this space or put the dustbins elsewhere. Contrary to previous Siedlungen, May did not provide a different unit for the end of the row, nor a return for the low walls in the corner as he had done in the last phase of Praunheim.78 The garden of the last plot is thus directly visible from the street. The inhabitants have overcome this problem by planting hedges or building small walls. 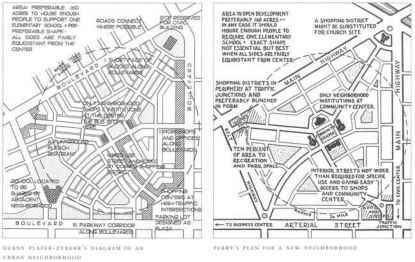 But the corner plot, because it was easily accessible and the only one serviced by vehicles, became the ideal place for commerce. Of the six shops that opened in Westhausen, where originally none had been envisaged, five are located on corner plots and the sixth is on the Zillerstrasse, i.e. in the only row directly located on a road for car traffic.